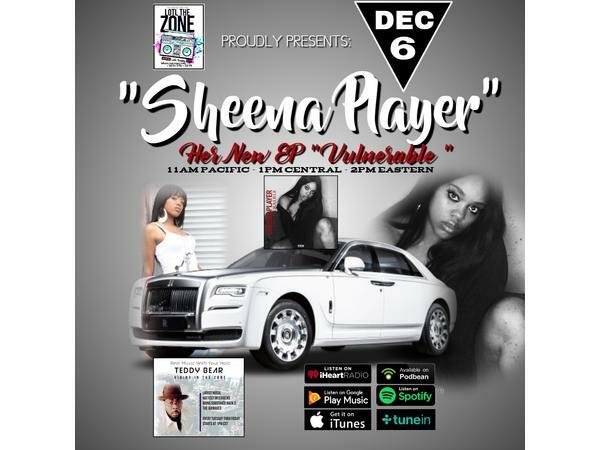 LOTL The Zone Welcomes Sheena Player, Releases new EP " Vulnerable "
If you liked this show, you should follow LOTL RADIO THE ZONE. Sheena Player Releases new single " Vulnerable "
Sheena Player first made her vocal skill apparent when she first sang as an infant according to her mother, at that moment Sheena’s parents realized her gift.Sheena has recorded with some of the industries most prominent producers, such as Donald “XL” Robertson, Joseph Liemberg, Gorden Campbell, Jim Gittum and Eric Seats/Rapture Stewart just to name a few. She had the immense opportunity to open for the Tampax “Total You Tour ” in Los Angeles along side one of hip-hop's pioneer feminists Queen Latifah. She’s been featured several times as a performer at Magic Johnson’s Annual Midsummer Nights Mardi Gras making her a crowd favorite. Sheena is currently touring the with ARP Productions, Aids responsibility project, she recently performed in Washington D.C. and Toronto, Canada and is schedule to perform at numerous venues within the United States as well as oversees. Sheena has had the pleasure of being a go to background vocalist to the industries elite Kelly Price, Heather Headly as well as Sean Kingston. Sheena aspires to be looked at and included in the category of great musicians amongst her peers. Instantly taking a studious admiration to great vocalist like Deborah Cox, Whitney Houston, Faith Evans and Lauryn Hill Sheena has always taken a liking towards strong vocalist and vigorous lyricist. Not only is Sheena a breathtaking singer, she is a phenomenal songwriter. Sheena declares, “Music is my true love, I was definitely born to sing, write and perform. Expressing my feelings through song is my zeal.